Here's a handy tip I learned many years ago that makes soldering a little easier. I'd like to take credit for thinking of it, but cannot. 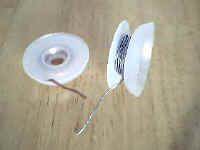 Take an empty solder wick spool and fold the curved plastic bottom back per the figure below. 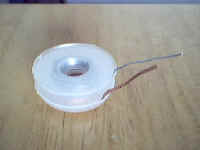 Wind solder onto the spool. Close the bottom. Stack the solder spool onto a solder wick spool for extra convenience. I usually have a spool with thick and a spool with thin solder.